Why do we procrastinate? Dan Ariely, Ph.D., Professor of Psychology and Behavioral Economics at Duke University, had the same question. To answer it, and many other questions pertaining to human behavior, he probed a relatively new field of study, behavioral economics. His conclusion, certain aspects of human behavior, no matter how irrational, do make sense; humans are Predictably Irrational. Spoiler Alert: Over the next few weeks we’re going to take a look at some of Ariely’s findings in his book, Predictably Irrational: The Forces that Shape our Decisions. Ariely conducted scientific studies with his own college students, offering some classes the option of setting their own due dates for assignments, and others a strict deadline schedule. The classes with firm deadlines were more likely to turn their papers in on time, and on average scored higher. For many, having an experienced professional, or a supportive working partner, can definitely help us get through those “hot” emotional times and keep us moving in the direction we want to go. 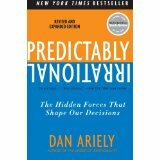 Predictably Irrational (2010) is just one of Dan Ariely’s New York Times bestsellers. To read more of his books that delve into the rationale behind why humans do what they do, consider The Upside of Irrationality: The Unexpected Benefits of Defying Logic (2011) and The (Honest) Truth about Dishonesty: How We Lie to Everyone-Especially Ourselves (2013).